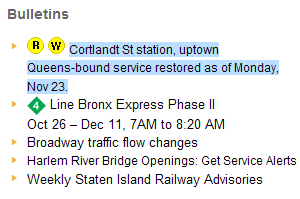 This entry was posted on Tuesday, November 24th, 2009 at 1:11 am	and is filed under service alert, subway. You can follow any responses to this entry through the RSS 2.0 feed. You can leave a response, or trackback from your own site. The station was closed quite a long time, but if you saw the construction done you would understand why. (I did, on a tour.) Literally a level was built beneath the existing station. What was sitting on ground is now the 2nd level. That’s not easy to do. It’s a pretty impressive piece of construction. 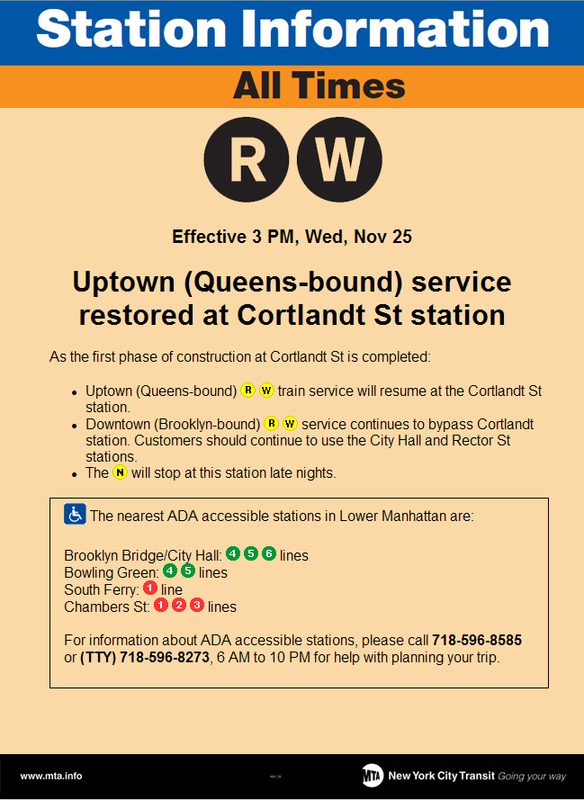 But for some reason the MTA prefers to keep their successes a secret and only let the failures get pubicized. 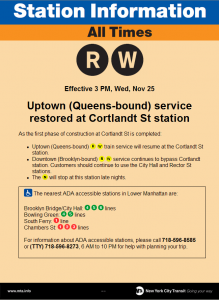 The station was closed for waaay too long but the last six to seven NYC subway maps issued to the public show BOTH sides open – – even the list of accessible stations show Cortlandt Street – – Downtown only.